For once, Rabbitear was not looking to nap - ah! The sky must be falling then, the world ending. No, not that - instead, he was fuming. The weather, dark and dreary, paralleled his mood but did little to help lighten it. Jaw set, mossy gaze narrowed into slits, and tail lashing, cats would do well to avoid the tawny tom carving a gash down WindClan territory. The reason behind his anger was scattered, drawn-out, and collective in nature. A multitude of trivial matters, piled up and finally overflowing, had combined to create the swirling pool of pent-up anger that was his current state. An idiotic kit running circles around his paws, tripping up his long limbs as he made his way to the already picked over prey pile. A wet, sopping sleep spent shivering in the rain, too irritable and pelt bristling too fiercely to accept the warmth of his fellow warrior’s flank. Having not a single clue on how to train Shypaw. How could he possibly pass on the necessary skills of warrior hood to a cat who never uttered a word? The task seemed impossible. And why, in StarClan’s name, did he receive another apprentice in the first place? The clan had seen what happened with Sandstrike, evolving into a shell of himself under his mentor’s ‘watchful’ eye. He heard the whispers, the murmured rumours that he had done something to break the originally lively and spirited tom. Why then - why - had he been entrusted with the future of yet another cat? Redstar clearly had a vendetta. 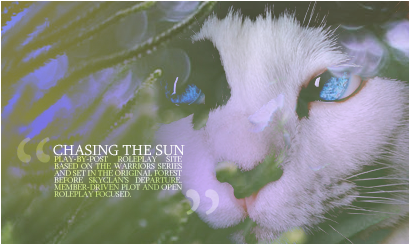 Back in WindClan camp, the small she-cat, always infuriatingly silent, had looked up to her mentor with eager eyes - expecting eyes - ones that suggested her intent to train. That had been the last straw. In a fit, as cold as his actions likely came across, the tom had spun on his heels, evacuating the clearing before Shypaw had the chance to bound after him. He had passed Wrensong on his way out, her expression immediately brimming with concern, but he hardly acknowledged her before storming away. No point in lingering and thus lashing out at her. Rabbitear flicked his ears in stony irritation, nearly startled when he realized how far he had gone. The gorge was before him, the rocky drop-off just fox lengths away. The waterfall, a huge rushing expanse of white rapids, was close enough that he could hear its roar. Cats were always warned of the dangers this part of the territory brought, but the potential for injury seemed to coexist well with Rabbitear’s mood. He dragged his unsheathed claws against the moor flooring, the mild act of violence already beginning to cool his temper. 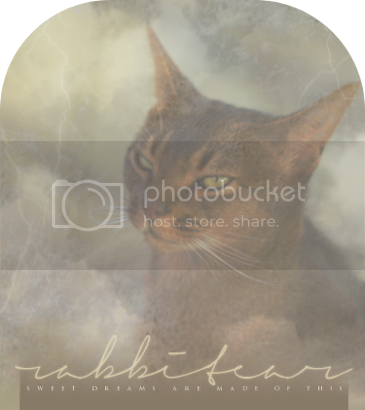 He glanced at the sky, rolling thunder clouds blotting out the sun, and sent a silent, haughty prayer to StarClan to keep the rain away. Or else. he stunning molly had simply been making her way around the land, curious as to what kind of prey she could find lurking that wasn't rats this time of year. She had a lot on her mind, there was no question about that. Spending most of her life flirting and drawing other cats away from their own little quarrels in life could leave a cat with her own when given the chance, always shoving her own emotions out of the way in order to make room for her tasks at hand. Valentine was a bundle of confidence at all times in her life, but her conversations with Will left her a little lost. They weren't romantic, oh no she was sure of that, but what were they, Business partners? Maybe. However now was not a time to sit thinking on that wandering tom, with her eyes looking just barely to the right she found a better task. "Goodness that one is a little upset." She muttered to herself, watching a tawny coated tom seem to radiate anger. This was the exact condition Valentine needed him in though, the more negative emotions the easier it was for her to get under their skin and find what makes them tick. They also seem to fall for a pretty face easier that way, so its a win win for her. Running her tongue quickly over her fur the pointed she-cat began her short track towards the tom, bouncing gracefully into the moors. This will either go really good or really bad, she wasn't sure, but he seemed to need an outlet either way. "Oh darling." She called out gently as she got close enough. It was now or never. "You don't seem to be having a good day today, thats not ever good for a handsome one such as yourself." Valentine generally held a soft purr as she spoke, giving her a sweet innocent sound. Her bright blue eyes looking over the tom as she finally came to sit down just barely four tail lengths away, giving him the space to decide if he wants anything with her or not. It felt good to have his claws in something, he decided. Recent moons had not been conducive to utilizing the sharp barbs concealed within his paws. Despite the rumoured tensions mounting between the clans and the scattering of rogues hunting clan cats, there had been little need to exercise the battle skills picked up as an apprentice. Maybe what the tom needed was a little… release. Something exciting, something dangerous. The monotony of life had been slowly eating away at his temper, picking apart the fabric of his patience. The alliance between ShadowClan and WindClan, recently formed and undoubtedly destined for eventual collapse, was soon to confront the killing non-clan cats soon enough. And Rabbitear, no matter how hard Swiftfoot would inevitably try to prevent it, would be there. Wrensong and Shypaw, however, would not, if he had anything to say about it. A purred coo made the warrior stop in his tracks, oversized ears perking to the sound. His nose scanned the surroundings, the scent foreign and distinctly un-clanlike. The voice was gentle, a soft and lilted tone that bordered on melodic in nature. 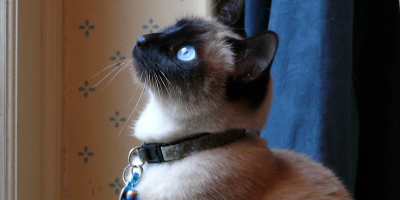 Coming into view was a light-toned she-cat, with a darker face and paws, with eyes like a clear blue sky, cloudless and pure. His mood lightened slightly at the sight of such a beautiful specimen, immediately intrigued. His gaze fell on the collar around her slender neck, a little bell hanging from the loop beneath her chin. He turned his head sideways, curious. He sincerely doubted a kittypet would dare venture this far from the twolegplace - and to the gorge, specifically. The sheer drop to a certain death was hardly a draw for those accustomed to bowls of milk and whatever other strange affections twolegs provided. And one brazen enough to come right up to a fuming clan warrior? Highly unlikely. Why then, would the pretty little cat be sporting an obvious sign of ownership? His interest was piqued and the idea of chasing her from his territory far from his thoughts. She hardly looked dangerous - he was entirely sure he could take her in a fight, if needed. Though, ruining her silky pelt seemed like an unnecessary sin he wasn’t willing to commit. She settled herself into a seated position at a closeness that could only be described as bold. He recognized the flirtatious tone in her voice, the dipping reverberations of attempted manipulation, because they were ploys he often utilized himself. Interesting. Mimicking her stance, he wrapped his tail around his front paws. he slightest grin crossed the females expression, her gaze just grazing over his pelt, the tilt of her head so small it was barely noticeable. Afraid of a big spooky clan kitty, oh no. Valentine never was one to show a hint of fear no matter what it was in front of her, this was something she proved time and time again. What was he going to do to her anyways? shove her down into the gorge, tragic at best. She had no ties to anyone any longer so who would miss her in the end, maybe Will but doubtful. "Oh goodness Sweetie, why would I be scared of a clan kitty cat like you?" She asked, getting to her paws, walking slowly around him, her tail dragging just enough to push a small puff of dust in its wake. "You can chase me from your land, though you wouldn't be the first. You could try and hurt me, but again who hasn't tried yet? Kill me but what kind of trophy would I make to the clan? Little me, they'd know i couldn't do harm to anyone, it'd be pure murder." She laughed softly at the thought. "That raises the question though, what could you do with me, hm?" Valentine purred, stopping just behind him, her whiskers tapping slightly against his shoulder, the vibrations of her voice and purr able to be felt as her fur grazed his, even the bell close enough that you could hear the little metallic ball inside just barely moving back and forth in its metal prison. The confidence radiating off of the small she-cat was obvious and hefty, surprising in a way that felt tantalizing to the clan-born tom. She was new, shiny, coy - a welcome change from the all business no play air that was practically written on all of WindClan’s maws. If he had to listen to one more report on territorial bird nests he would throw himself off the gorge and take his chances with the jagged rocks below. His anger, burning so brightly just minutes ago, began to snake its way back inside him, ebbing away as his curiosity remained piqued. Rabbitear never could turn down a flirtatious banter, whether it was with a clan cat, a loner, or a cow, for that matter, even in his atrocious mood. Making an obvious show of sheathing his claws, Rabbit watched the trespasser with increasing amusement. It was like looking in a mirror, his own self reflected back to him as the fae cooed and purred. She was good and, for a brief moment, he pitied the poor chaps sweet talked by the beautiful stranger before him. 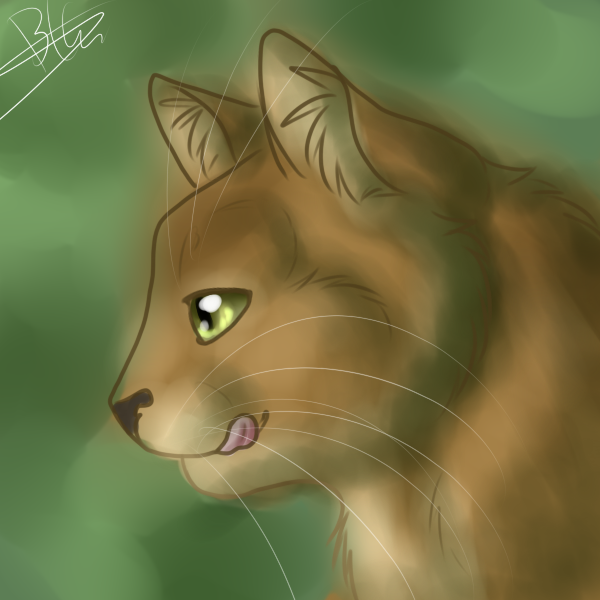 So much so that he considered sending out a silent, respectful prayer to StarClan on their behalf. Bless their souls - she surely took them for everything they had. He felt her form work its way around his, floating like a forest fairy, skimming the ground near soundlessly. Her words, he realized, were actually quite sensical. Although murdering her was hardly crossing his mind, he doubted his clan mates would be overly thrilled with the body of a seemingly harmless pet. “Little me, they'd know I couldn't do harm to anyone, it'd be pure murder.” He let out a light chuckle at this, gaze remaining forwards as she circled him. She came to a stop beside him, her pearly whiskers tickling his shoulder. He raised a paw, giving the silver ball a gentle flick and filling the forest air with its clinking.